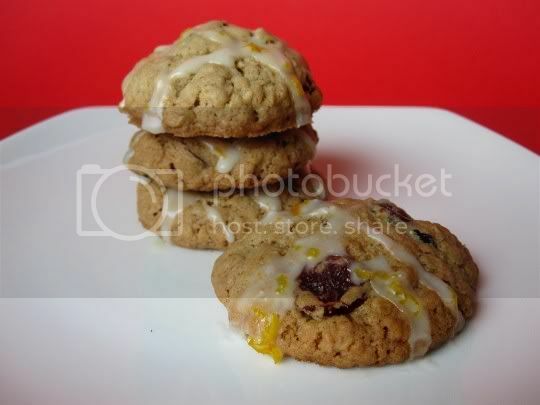 The classic combination of cranberry and orange is oh-so-delicious, and in a cookie, it's out of this world! These amazing little cookies are perfect in every way: flavor, texture, size, and ease. Start out making a standard oatmeal cookie, but with added dried cranberries, and roll the dough into one-inch balls (fun!). Bake until puffy and golden, and once cooled, drizzle with the to-die-for citrus glaze. Seriously, this stuff takes the cookies to a totally different level. The glaze--a simple mixture of powdered sugar, lemon juice, and orange zest--is tart, tangy, sweet. The orange zest releases so much of its oil and aroma, that it's hard to believe this is the only orange flavoring that goes into the glaze. It's so good, you almost want to drink it. The cookies are crispy and crunchy on the edges, but soft, thick, and chewy in the middle. Chockful of cranberries, each one is covered with a generous amount of citrus glaze. Because these are almost bite-sized, you might want to be careful with how many you eat! Make again? Yes. The cookie's unique and surprising flavors make this a sure winner, and perfect for winter holidays. Vegan variation: Substitute vegan butter and egg replacer.